The chalkboard is so hot right now. 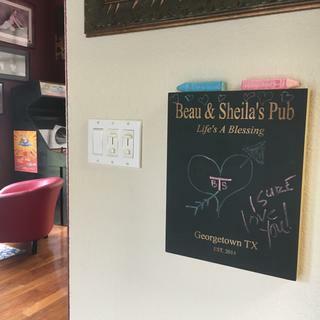 Especially chalkboard signs – a new twist on home and bar decor! And better than a regular old chalkboard, this bar sign can be personalized with up to three custom lines of text. Your favorite quote, bar name, sentiment, you name it. Also perfect for weddings and big events. Chalk surface wipes clean with a damp cloth every time so you can reuse over and over again. Neat piece! Very nice addition to bar that allows us to write cute stuff welcom messages to guests announcements and the like. It uses any suitable chalk and cleans off easily. It is big enough to make a statement but too big that if is hard to place. Stirdy durable construction. It looks great! It’s a Christmas gift for my son-in-law, I am sure he will love it!! The product was exactly as described and the customer service was phenomenal! have two taps, two different beers going. Wanted a sign to let guests know what is on tap. We are building an outdoor bar and my husband brews. 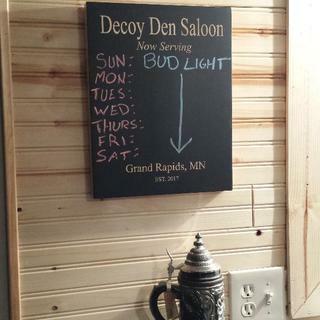 Just yesterday he said he'd like a chalkboard to display what's on tap. I'm looking forward to giving this gift to him. it's not to big and not to small just right for my home Bar. I purchased this as a gift for my father-in-law for Christmas. He is opening his own brewery to be opened next year. Excellent gift idea for my son-in-law for his new home bar! My sister and husband are building a new house with a bar and beer taps. I thought this would be a great way to display what beer is on tap. It is a Christmas gift. Christmas present, they just put a small bar area in their new homes very large garage. can liquid chalk or chalk pens be used with this board? BEST ANSWER: I cannot tell you if those particular items work on this since it was a gift and I do not use it myself. I will say that it was a gift for my in-laws who do a lot of entertaining and they LOVE it! I would not buy this board again. It seemed more like a piece of wood painted black than a chalk board. It was hard to write on it with regular chalk. Thank you for your feedback. I'm sorry to hear you had trouble with writing on your chalkboard. I haven't used this product personally, but on new chalkboard surfaces I've used before, I found that if you "prime" the chalkboard by rubbing a piece of chalk all over the surface then wiping it off with a dry cloth or eraser it ends up being much easier to write on. I hope that helps! We only use traditional chalk.